Archaeologists excavating in the Timna Valley near Eilat have discovered fabric that was dyed red and blue. This is the first time that such a colored clothing has been discovered from this ancient period. The Times of Israel provides a summary of a journal article and includes some photographs and a video. Since 2013, Dr. Erez Ben-Yosef of Tel Aviv University has directed excavations in the Timna Valley where his team has found textiles dating back to the Iron Age (11-10 centuries BCE). On some of the fragments, there is a decorative pattern of red and blue bands. According to Ben-Yosef and the IAA’s Dr. Naama Sukenik, the findings indicate that the society at Timna, identified with the Kingdom of Edom, was hierarchical and included an upper class that had access to colorful, prestigious textiles. The concept of highly prized, skilled laborers flies in the face of conventional wisdom, which had supposed that slaves had largely manned the isolated copper mines. Personally I think the speculation about the identification of the workers is unwarranted, given that we have essentially nothing to compare this with given the lack of preservation of perishable materials in the rest of Israel. And if the dating to the 10th century is correct, then this area was likely under the control of Israel, not Edom (2 Sam 8:14; 1 Kgs 9:26; 2 Chr 8:17). But one can certainly conclude that the workers here had access to a good shopping mall. The official press release is posted here. The AFTAU has issued a press release here. Some high-res photos are available here. A few years ago, we wrote a recommendation when Bible Mapper version 5 was first released. At the time Mark Hoffman, a Bible Mapper user, recorded seven tutorial videos to help out new users. Mark just moved the tutorials over to YouTube two weeks ago. The videos are a fantastic introduction to some of Bible Mapper's customization options, and they will give the jump start you need to start creating custom maps right away. BibleMapper can be downloaded here. Many features can be used with the free version, but a one-time license key ($37) is required to save your work and to access advanced features. Be sure to watch Mark Hoffman's tutorial videos on YouTube to help you quickly get started making maps. Ability to customize the look of the terrain, to select features and cities to be displayed, to modify the look and position of labels, and even to import your own sites directly using a kmz/kml file. Permission to use the maps you create copyright-free in papers, lectures, websites, and publications. The massive “Spring Tower” built over Jerusalem’s Gihon Spring was originally dated by archaeologists to the Middle Bronze Age. A new study, however, indicates that the fortifications were constructed in the 9th century BC, the time when Jerusalem was ruled by Jehoshaphat and Joash. The new dating is based on radiocarbon dating of material found in sediment underneath boulders at the tower’s base. The previous discovery and dating to the 18th century BC radically changed our understanding of the development of the city, suggesting that Jerusalem was home to an advanced civilization about eight centuries before David’s conquest. This new re-dating will force the re-writing of the city’s history, not only in Canaanite times but in the Judahite period as well. One can speculate what might have prompted such construction and which king it occurred under. I haven’t read the full study (available here for $35), but from other research I wouldn’t put too much weight on the date, as radiocarbon dates in the 9th century usually have quite a bit of flexibility. But if the tower dates earlier than the time of Hezekiah, one can only wonder why he considered the relatively recent fortification insufficient and the need to construct a water tunnel essential. A summary of the research is posted at the website of the Weizmann Institute of Science. I’ve talked with a few people recently who weren’t aware of some of what we’re doing and some of the options available, so I thought I’d take a minute to provide a brief summary. First, you don’t have to check the blog website every day to keep up with our weekend roundups and other reports. You can subscribe to receive the blog by email here. “He tends his flock like a shepherd: He gathers the lambs in his arms and carries them close to his heart” (Isaiah 40:11). Third, our BiblePlaces Newsletter is an infrequent but valuable source of our latest projects. This is a good way to make sure you know what we’re creating, even if you’re not interested in the daily or weekly photos and posts we do. We are preparing a major announcement for later this summer. All of these subscriptions are free, and we promise to treat you like we want to be treated (no spam, no pestering, nothing stupid). And if we try to sell you anything, we promise it will be awesome. Join us on any of these as you like! And feel free to tell your friends about us. One of the persons mentioned in Luke 3:1-2 is "Annas" the high priest. Annas was the patriarch of an important priestly family in the 1st century AD. Indeed, the 1st-century historian Josephus says about him: "Now the report goes that this eldest [Annas] proved a most fortunate man; for he had five sons who had all performed the office of a high priest to God, and who had himself enjoyed that dignity a long time formerly, which had never happened to any other of our high priests" (Antiquities 20.9.1). Furthermore, his son-in-law Caiaphas was also high priest (John 18:12-14). Thus, starting with Annas himself, there were seven men who occupied the high priesthood tied to his immediate family. Though he was not the reigning high priest at the time of the trial of Jesus (Caiaphas his son-in-law held the official position), Annas was, nonetheless, a key player in the sequence of events. In fact, Annas was the first person that Jesus was taken to after his arrest (John 18:13). This fact alone demonstrates Annas's continuing authority and influence even when others actually held the office of high priest. As a result of his portrayal in the biblical text, Annas can be found in a number of dramatic artistic expressions throughout the history of western culture. 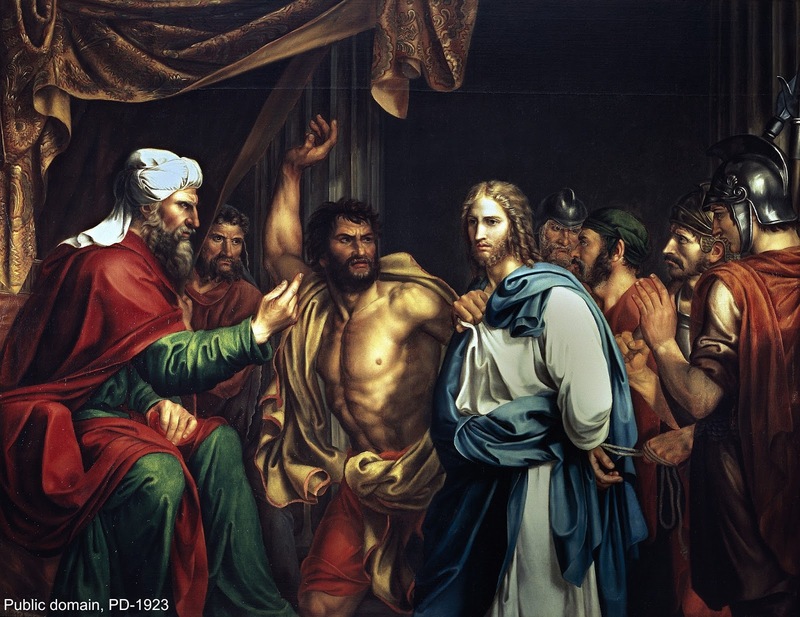 For example, the following painting by the Spanish neoclassical painter Jose de Madrazo (1781-1859) depicts the moment when Jesus is about to be slapped by an official of the high priest as recounted in John 18:19-23. The painting, dated to 1803, is oil on canvas and is located in the Prado Museum in Madrid. Of further interest is the suggestion by Leen Ritmeyer that the structure in Jerusalem identified as the "Palatial Mansion" (or "Herodian Mansion") may have been the home of Annas, though a cautionary note by Todd Bolen should also be considered.